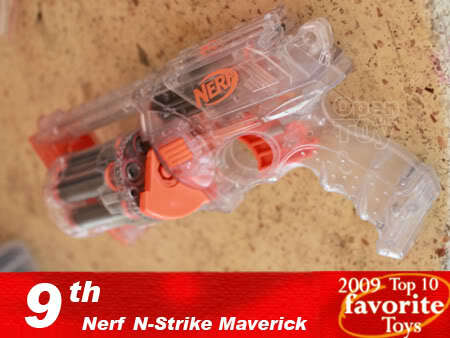 I promised Shaun to do a Top 10 list of Favorite Toys in 2009 and so here are MY Top 10 toys of 2009 which I had opened and reviewed this year. 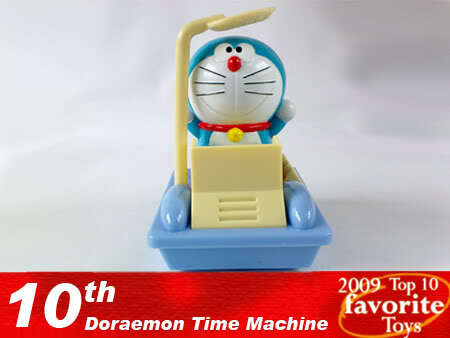 I have been eating fast food for Doraemon series and among the whole series of Mcdonald Doreamon Happy meal toys, Doraemon in time machine has my best love as it resemble the signature pose for various Doraemon comic book cover. The moment I laid my eyes on this set of Gashapons, I knew I have to get it. One of the catalysis was that I just started playing the Mario Kart during that period. To top it off, the toys capture the cuteness and the signature looks of my Mario memories. I have always love the character in the Three Kingdom story. Holding a spear and riding a white horse to bash through thick enemy line just to save his Lord's son. Such loyalty. Since this toy was assembled by me, I have to have some love for him. I am pretty pleased with what I have done in painting thanks to the gundam markers. Ice Bat deserved the bronze position in this ranking. The more I look at him, the more I love him. The moment I off my room light, he would stood out to say goodnight to me with his glow (since he has the glow in the dark feature). Plus that silly expression on his face just make me smile as I turned in. Not many toys can put a smile on my face you know. Talking about putting smile on one face, how can I leave the Joker out since he appear quite a few time in my posts? 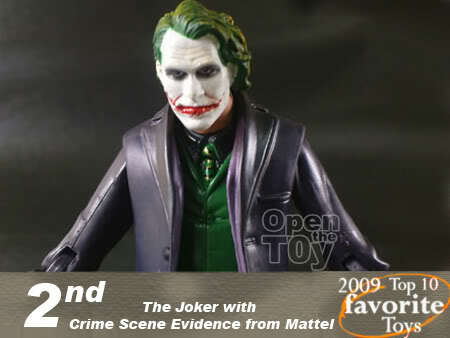 The figure capture the character of the Joker delivered by Heath Ledger for a 5 inch figure. For that he deserved the Silver award. 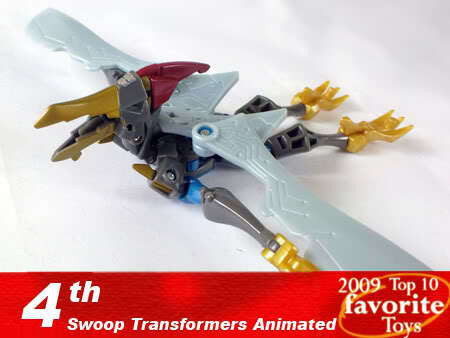 He was the first toy I bought in 2009 (New year day) at a very good price. What a way to start the year. I guess it was no surprise that Yotsuba get the Gold position. She was a good model with her brilliant smile and I still feel bad that I lost one of her original part during the photo shoot outing. Regardless of her lost, her smiling face still brighten everything whenever she appear in the photo. Nice top 10 - some good stuff - can't wait to see what 2010 holds for us all! Haha thats a great list!! 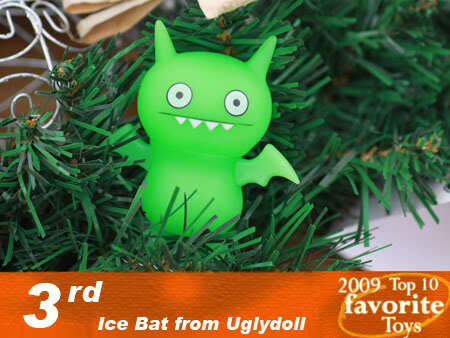 Yes ice bat got the bronze award!!! 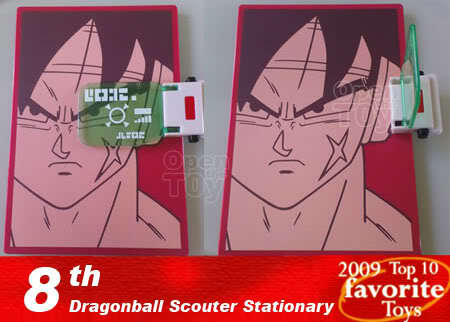 By the way that dbz visor is a very interesting stationery!! Seeing your's and kastuden's top ten post I am very eager to do my own top ten too! 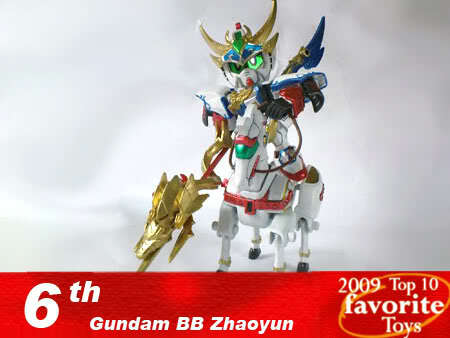 Ps : Your Zhao Yun gundam is very nice!!! Agree. Hope to see more good and reasonable pricing toys! A very fun list to read, LEon. It is only fitting that Yotsuba gets the number one spot,as she's been a constant feature in your posts this year. Wishing you a happy 2010 in toy collecting and keep up the great work at your blog. I thought your favourite female character is "Miku Hatsune" as you uploaded a lot of posts regarding this virtual music singer..
have you try nendoroid ?? NICE list...I just love to see all the toy bloggers' list. All so different! 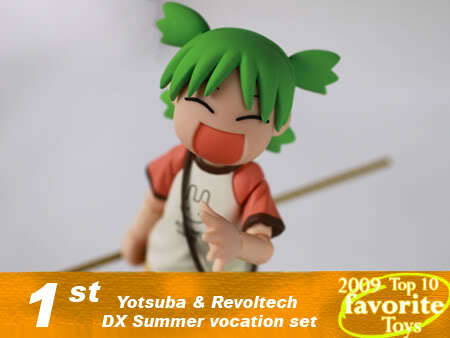 Yotsuba derserves the top space, one of my favorite revoltechs. 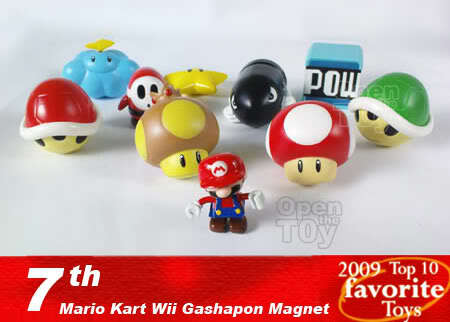 Liking the marios gashapons also. k k pal... then my 1st publishing in 2010 will b My Own Top 10 Collection Figures... so i hav to make some selections & voilá... thx 4 ur appreciated comments =D !!! Indeed. It will create toy awareness too. You have a yotsuba too? Cheers for Yotsuba for being the first. ^^ Love her very much. Your top ten toys filled us with many fun, cuteness and memories from the good old days. It's no wonder you feel so down when Yotsuba lost her pony tail. Thanks bro for your constant support. THanks! Same to you too! Happy New year!